3. Looking for a fast and easy way to remove cellulite before going out or to the pool? Try rubbing a slice or two of cucumbers along your problem area for a few minutes, the phytochemicals in the cucumber cause the collagen in your skin to tighten, firming up the outer layer and reducing the visibility of cellulite. Works great on wrinkles too!!! 4. Stressed out and don't have time for massage, facial or visit to the spa? 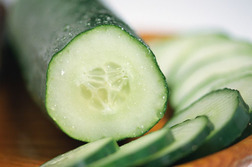 Cut up an entire cucumber and place it in a boiling pot of water, the chemicals and nutrients from the cucumber with react with the boiling water and be released in the steam, creating a soothing, relaxing aroma that has been shown the reduce stress in new mothers and college students during final exams. 5. Just finish a business lunch and realize you don't have gum or mints? Take a slice of cucumber and press it to the roof of your mouth with your tongue for 30 seconds to eliminate bad breath, the phytochemcials will kill the bacteria in your mouth responsible for causing bad breath. These tips come courtesy of a dear friend Stephanie McIntyre.